Need help promoting your event or program? We can help you reach your audience, whether they are on campus, in the region, or around the globe. 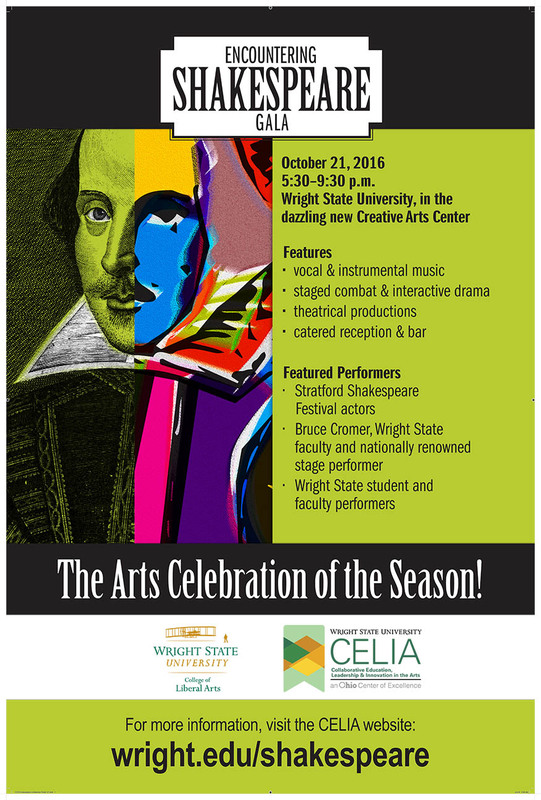 The Office of Marketing worked with the College of Liberal Arts and CELIA to market The 40th Annual Ohio Valley Shakespeare Conference and a gala evening, "Encountering Shakespeare." Marketing included website development, alumni emails, ads, newsletter articles, public television promotional spots, campus displays, event programs, promotional items, t-shirts, tent cards, bookmarks, posters, WINGS announcements, and ads for the Ohio Council of Teachers of English Language Arts. The visual design of materials for this event represented the convergence of both classical and modern takes on Shakespeare.